The timely, low-budget cinematic masterpiece of the 1970s was written, produced and released by director Francis Ford Coppola before and during the Wategate era (and between his two Godfather films) - a time of heightened concern over the violation of civil liberties. Its claustrophobic themes of the destruction of privacy, alienation, guilt, voyeurism, justified paranoia, unprincipled corporate power and personal responsibility effectively responded to growing, ominous 20th century threats of eavesdropping to personal liberties. After his phenomenal success with The Godfather (1972), Coppola's technically-brilliant, absorbing film was a critically-acclaimed work, but it failed at the box-office. In the 1974 Oscar competition, The Conversation competed for Best Picture with Coppola's own sequel The Godfather, Part II (1974). It had a total of three award nominations (without any wins): Best Picture, Best Original Screenplay, and Best Sound (Walter Murch and Arthur Rochester). Notably, there were two against-type roles of young stars from Lucas' American Graffiti (1973): the philandering/murderous role of a socialite by Cindy Williams, and the duplicitous role of a corporate executive assistant by Harrison Ford. The marvelous sound work on the film was deserving of an Oscar for Best Sound for its effective sound-mixing of interdependent elements: taped conversations, muffled voices, background and other mechanically-generated noises, musical/piano accompaniment (Harry Caul's signature theme) and other ambient sounds. The film has some similarities to director Michelangelo Antonioni's provocative Blow-Up (1966), Brian DePalma's thriller Blow Out (1981), Tony Scott's Enemy of the State (1998), and Gore Verbinski's The Ring (2002). And the bloody scene in the bathroom paid homage to Hitchcock's Psycho (1960). The film opens, under the credits, with a bird's-eye view of Union Square in downtown San Francisco during a busy lunch time on a sunny day in December [later identified as December 2nd, 1 PM]. Pedestrians, office workers on lunch break, and Christmas shoppers mingle together in the long view. Slowly, the camera zooms closer and picks out a young, white-faced Mime (Robert Shields), dressed in a black-and-white drum major's costume, who imitates and parodies unsuspecting bypassers. A band of street musicians entertains in the park, playing "When the Red, Red Robin Comes Bob, Bob, Bobbin' Along" - the tune is mingled with other strange mechanical noises. The Mime selects a mid-40s aged, balding gentleman in the crowd who's sipping coffee and wearing a grayish, transparent rain slicker. 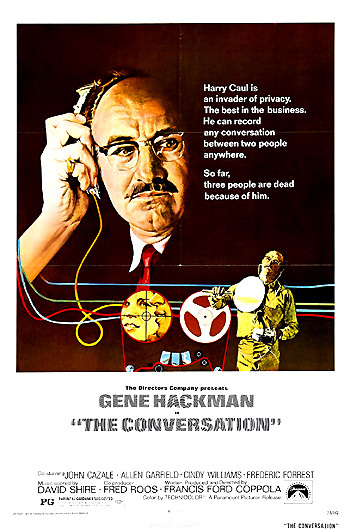 The man - soon identified as the protagonist - is Harry Caul (Gene Hackman), a bespectacled, slightly balding, mustached, mid-forties leader of a professional team of snoopers-for-hire who are monitoring something in the park. Below a neon-lit sign for the CITY PARIS (on top of an image of the Eiffel Tower) high atop a building is a bundled-up individual wearing headphones holding an extended shot-gun microphone pointed into the square. It becomes increasingly clear that the target of surveillance, where the telescopic gunsight is aimed, is a young couple, later identified as Ann (Cindy Williams), a young pretty woman in her twenties, and a clean-cut, well-dressed company executive Mark (Frederic Forrest). Ann: Oh look, that's terrible. Mark: He's not hurting anyone. Ann: Oh God! Every time I see one of those old guys, I-I always think the same thing. Mark: What do you think? Ann: I always think that he was once somebody's baby boy...and he had a mother and a father who loved him. And now, there he is, half-dead on a park bench and where is his mother or his father or his uncles now? Anyway, that's what I always think. Stanley: Who's interested in these two, anyway? Harry: I don't know for sure. Stanley: Then I figure it must be the Infernal Revenue. Their tapes always put me to sleep. Harry: Since when are you here to be entertained..
Stanley: Sometimes it's nice to know what they're talking about. Harry: I don't care what they're talking about. All I want is a nice fat recording. This is Harry Caul from upstairs...Yes, well, thank you very much. Thank you...You're really very nice, yes, but...what I wanted to talk to you about was how did you put it in the apartment?...What about the alarm? Oh you did?...I thought I had the only key...well, what emergency could possibly...all right, yes. You see, I would be perfectly happy to have all my personal things burned up in a fire because I don't have anything personal. Nothing of value. No, nothing personal except my keys, you see, which I really would like to have the only copy of, Mrs. Evangelista. While talking to her, he both removes his trousers and opens up a greeting card sent in the mail from his bank: "TO OUR VALUED CUSTOMER, Harry (handwritten), HAPPY BIRTHDAY....HERE'S TO ANOTHER, 44 (handwritten), THE SECURITY PACIFIC BANK." [Behind him visible through his window, a construction crew is demolishing a building.] After realizing she has snooped into his mail, he is painstaking about remaining private: "As of today, my mail will go to a post-office box with a combination on it and no keys. Goodbye." Harry's sole means of relaxation that evening comes when he sits on a straight-backed chair in the center of his living room, a bland place dominated by phonograph equipment and loudspeakers, and plays his saxophone to the accompaniment of his hi-fi. After playing furiously along with a live jazz recording, he slumps in his chair, closes his eyes and looks inward, and bows his head to the recording's applause. ...among those pre-eminent in the field expected to attend are Hal Lipsett and Harry Caul from San Francisco. Kenneth Sperry will speak on "Surveillance and the Law" - wait a minute, listen to this...also attending will be William P. Moran of Detroit, Michigan...He's the guy that told Chrysler that Cadillac was getting rid of its fins. Bored with Stanley's talk, Harry begins methodically sorting through the materials from the previous day's work. In a mesmerizing scene, he threads and synchronizes three tape recorders with the tapes from the three locales (Unit A: shopping bag, Unit B: parabolic, Unit C: City of Paris). By playing all three recorders at the same time and varying their volumes on a mixer, Harry is able to construct, synthesize and splice together a fourth clearer recording onto another Ampex tape-recording machine. Painstakingly, he rewinds and replays fragments of dialogue - slowly piecing together Ann and Mark's audible conversation. Flashbacks cut back and forth to the footage from the previous afternoon. Ann: I don't know what I'm gonna get him for Christmas yet. He's already got everything. Mark: He doesn't need anything anymore. Ann: Well, I haven't decided what I'm gonna get you yet. Ann: A lot of fun you are. You're supposed to tease me, give me hints, make me guess, you know. Mark: Does it bother you? Mark: Walking around in circles. Ann: (spotting the derelict on the park bench) Oh look, that's terrible. Ann: Neither are we. Oh God. Every time I see one of those old guys, I-I always think the same thing. Mark: I always think of how when they had the newspaper strike in New York, more of those old guys died. Fifty of them frozen died in one night. Ann: Just because there were no newspapers? Later that day, Harry rides an electric bus to a pay phone on a street corner. Clutching a blue vinyl pouch, he places a call and asks for Extension 746, "the Director's office." He tells the male secretary: "I have the material and I'm calling for an appointment." Lying, Harry rejects the idea of a callback: "I'm at a pay phone and I don't have a home telephone." An appointment is made for 2:30 pm the following afternoon, when he expects "payment in full" from the Director for the tapes. That evening, as a sole traveler in the night with his wrapped birthday bottle of wine, he pays a functional visit to his mistress' apartment. At the base of the lit staircase inside the front lobby of the apartment building, he waits and listens - almost hiding like he is on a voyeuristic spy case, and then descends one flight of stairs to her apartment door. He stealthily approaches, quietly inserts his key, and opens her door. A young woman in her mid-twenties, Amy (Teri Garr) has been waiting for him in her bed. She wears white socks and a blue bathrobe: "I didn't think you were coming." Throughout the scene, Amy remains in the light, while Harry is shrouded in a cloak of shadows - and still wearing his translucent raincoat. She doesn't know very much about him (giggling "I didn't know it was your birthday") and asks him his age. He replies with a lie: "Forty-two." Harry: I don't have any secrets. Amy: (She points to herself) I'm your secret. You do have secrets, Harry? I know you do. Sometimes you come over here and you don't tell me. Once I saw you up by the staircase, hiding and watching for a whole hour. (Harry appears embarrassed) You think you're gonna catch me at something, you know? I know when you come over. I can always tell. You have a certain way of opening up the door. You know, first the key goes in real quiet, and then the door comes open real fast, just like you think you're gonna catch me at something. Sometimes I even think you're listening to me when I'm talking on the telephone. Harry: What are you talking about? Amy: I don't know. I just feel it. Really, I do. Amy: Where do you work, Harry? Harry: Oh, in different places, different jobs. I'm kinda a musician. A free-lance musician. Amy: Where do you live? And why can't I call you over there? Harry: (lying) 'Cause I don't have a telephone. Amy: Do you live alone? Harry: Why are you asking me all these questions? Amy: Because it's your birthday. Harry: I don't want people to ask me a lot of questions. Amy: I want to know you. Harry: Yes, I know you want to. I don't feel like answering any more questions. Harry: You never used to ask a lot of questions. Amy: Harry, I was so happy when you came over tonight. When I heard you open up the door, my toes were dancing under the covers. But I don't think I'm gonna wait for you anymore. In solitude, he leaves and sadly rides the bus back to his own apartment. In his mind, he replays the memory of eavesdropping on the young couple Ann and Mark, projecting his own isolation onto their encounter in the park.